Ah, the Mediterranean! It’s time to trade. It’s time to ship goods! But this time it’s different. It’s not just about winning auctions. It’s about fixing auctions so that if your esteemed colleagues win exactly what they need, they’ll have to take something less desirable as well. The game is in the pairing, and you are determined to come out on top. Enter the cutthroat world of auctions in the Mediterranean with Medici! 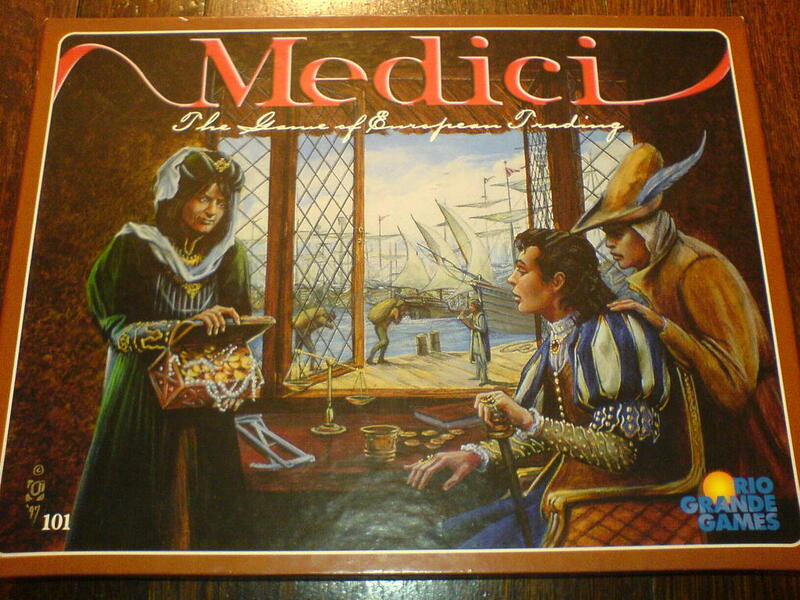 Medici is an auction game for 3-6 players. Players bid for lots to place in their ships’ cargo holds and earn points based on valuable ship loads and individual cargo. The player with the most points wins. 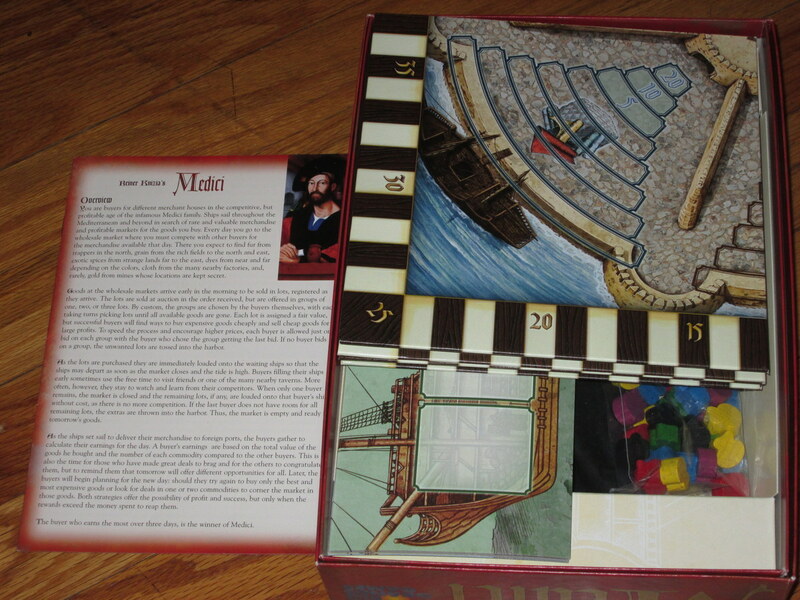 Each player begins Medici with an empty ship tableau and an amount of points based on the number of players. Players place their score markers on the lowest rung of each pyramid representing the commodities in the game. 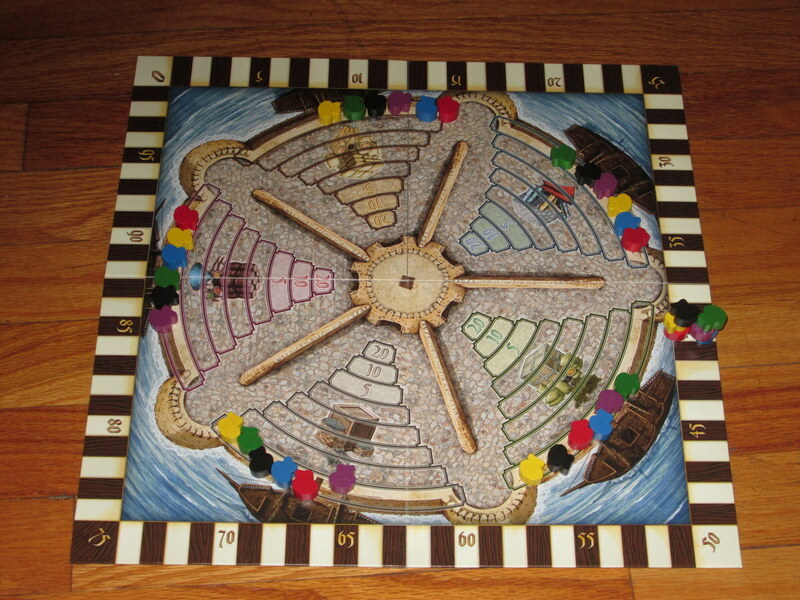 The game board for Medici. This tracks each player’s points and placement on the commodity pyramids, which score at the end of each round. 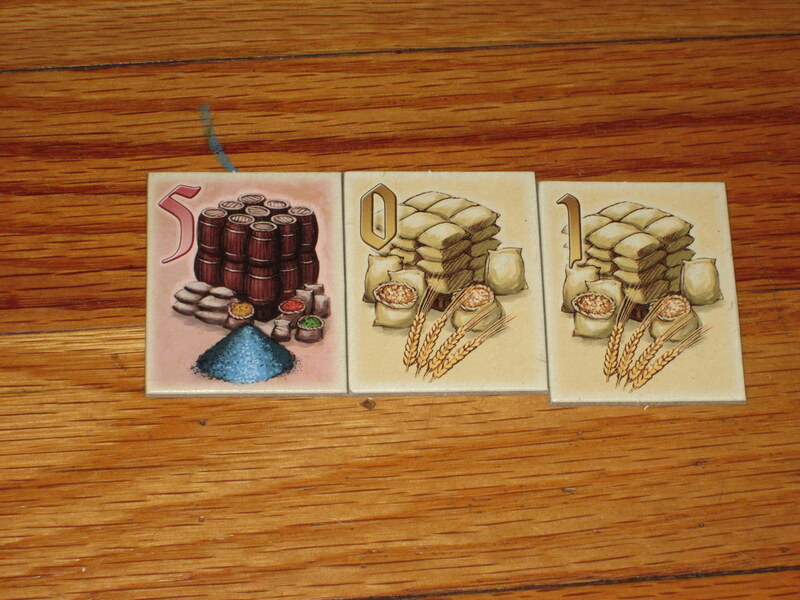 Each turn, a player auctions one to three tiles from the bag. This player…might have wanted to stop at the red 5. At the end of three rounds, the player with the most points wins. Kniziauction, or Trading in the Mediterranean? There are several components that contribute to Medici’s excitement. The first is how easy the game is to play. The rules are very simple: on your turn, you get to draw tiles to form the auction lot, then everyone gets one chance to bid. You score points based on whose ship is worth the most (new each round) and who has shipped the most of each commodity (carries over from round to round). So simple. But the simple framework provided by the game doesn’t make the game decisions any easier, and this is part of what makes Medici great. The rules (and theme) are simple enough that they get out of the way quickly, even for new players, allowing the tense decisions of what to bid and for what to take center stage. The ship tableaus in Medici. Each player can only claim five tiles per round, putting extra weight on every decision and making the bundling of auction lots exciting. The decisions in the game are tense because 1) players get only one chance to bid on each lot, and 2) players have limited space on their ship. Since players can bid only once, they have to determine several things all at once: how much is this auction worth to me? How much is it worth to the other players? Do I want to take this auction, or do I want to bid it up so another player doesn’t get it for a song? Will I be okay if they stick me with it? What is the ideal amount to bid to scare other players off but also get the best deal for myself? Players must consider what each player is after, which makes player interaction high. Similarly, player decisions are tense because space on ships is limited. Taking a hit on even one low-numbered commodity tile might put you out of the running for the most-valuable-ship evaluation at the end of the round. Of course, it might put you in a better position for the round-to-round commodity tracks, especially if you can climb to the top of your pyramid, where the bonus points are. There’s another consideration, too: if you fill your ship too early, you will be unable to bid later in the round. Players may only bid if they have room for the auction lot, and other players control the size of each auction. If you take a three-tile lot early in the round, if anyone else auctions a three-tile lot, you won’t have a chance to bid on it. So this puts extra weight on the decision to fill your ship early. Of course, this also makes for tense moments in deciding what to auction. 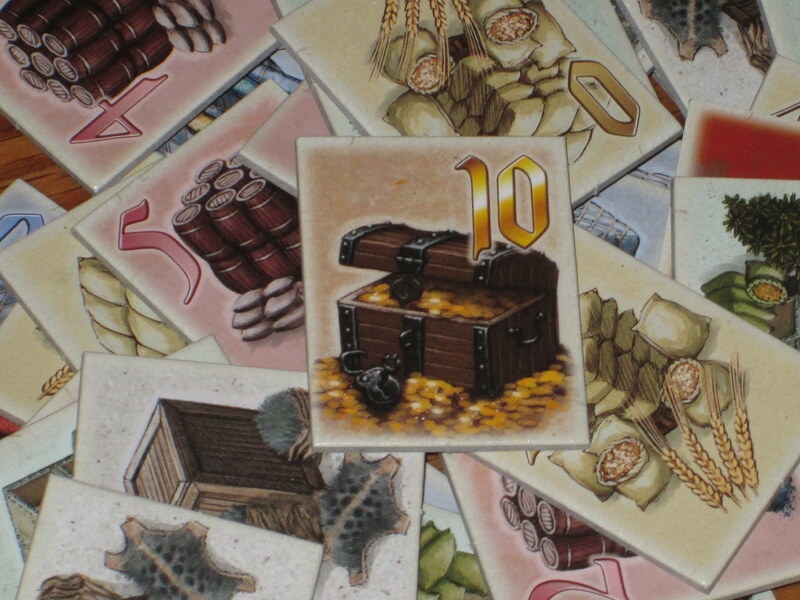 Each player may draw one to three tiles from the bag, and they’re drawn one at a time. The genius here is that everyone knows which tiles they ideally want; the question is whether those tiles they want will be paired with tiles they don’t want, and how much they will have to sacrifice in order to get the tiles they want. There is a strong element of push your luck in the decision of what to auction. If you draw a decent (read: high-value) tile first, should you try to draw another? Doing so could lower the overall utility of the auction–and if the first tile is one your opponent really wants, maybe that’s what you hope for. Of course, it could pair a tile you really want with something another player really wants, driving the pricetag up. You also have to consider, will drawing another tile eliminate any players from the auction, and is that a good thing? With only one extra tile for each player in the game, you can’t let too many auctions pass without bids, and even 0s, 1s, and 2s in your ship’s cargo hold are better than empty holds. And that’s what makes every auction interesting for all players. It matters which tiles are pulled out of the bag, and it matters when the current player decides to stop drawing. The commodity tiles. The gold tile on top is special in that it isn’t a commodity, but it does boost the value of your ship considerably when considered for most-valuable. It is usually not obtained cheaply, however. I mentioned that the rules of the game are simple, as is the framework for the game, but finding a balance between winning most valuable ship and winning commodity tracks is tricky. 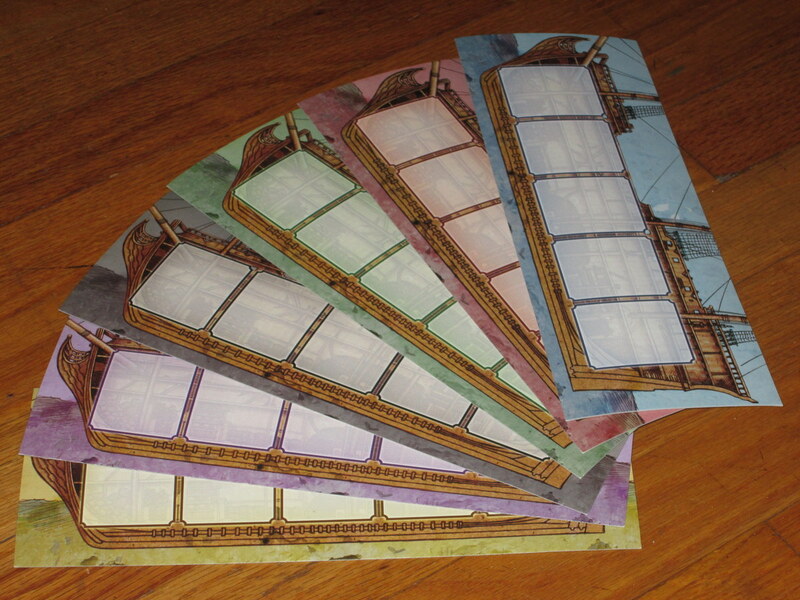 Players are rewarded for winning tiles that have high value, but they are also rewarded for collecting sets of colored tiles to advance up their pyramid tracks, no matter their value. Of course, if you don’t reach the top of the pyramid, all that matters is staying one step ahead of the competition–but reaching the top is a powerful motivator, and worth trying to achieve if you can. And since all (or most, in games with less than six player) decision information in Medici is open, it’s possible for players to count commodities and hedge their bets for which tiles it might be best to wait for (and hope they’re not paired with trash). All of this to say, even though the game is simple, there are many choices that players can explore over multiple games. I’ve played lots of times and haven’t mastered Medici. Part of this is due to the interesting balance of long- and short-term gains. Part of this is due to the intense player interaction in Medici. Everyone is involved the whole game through, and what other players do (and how they bid) is important to the gameplay. This is not multiplayer solitaire. In fact, I think Medici has generated the most riotous play moments of any Reiner Knizia game (and this in spite of the well-worn theme). It’s exciting to watch the current player decide whether to add another tile to the auction lot, and exciting to see if the first opponent will bid, and so on. It’s exciting to know that you’ve got only one shot at the auction, so you have to place your bid accordingly–too low, and you’ll be outbid; too high, and you’ll pay too much. It’s so much fun to get into other players’ heads, to bluff them (or be bluffed yourself), and to have the catharsis of revelation with each draw from the bag. Medici may not have “theme,” in the sense that most people use that word, but it makes up for it in providing a dynamic and engrossing experience. The game’s insert is…a little lacking. Oh well. The game is awesome, and the compact components can travel in another bin if they need to. All of this, of course, refers to the six- (and, to a lesser extent, five-) player game. 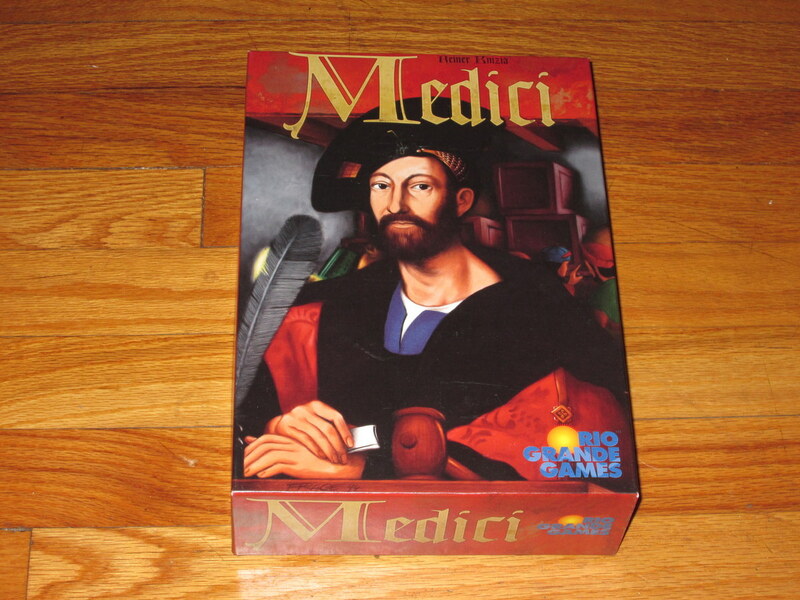 Medici is a great game, but I won’t play it with less than five. The reason is that for each player not in the full six-player game, six random tiles are removed from the game. Removing six tiles for one player still makes for an exciting game. Removing any more than that gives the game too much uncertainty, too much randomness, too little information to plan with. (The tile you desperately want might be out of the round.) As I said, Medici is a simple game to understand at a glance, and there’s not a lot of difficult “counting” to be done, so even new players are adept at it. I suppose it’s possible to remove specific tiles from the game to ensure equal knowledge, but the random removal of tiles suggested in the rulebook ensures that I’d rather play something else. However, if you have five or especially six players, Medici sings. I should add the caveat that Medici, as an auction game, can be difficult for new players if there’s a large experience gap. In Medici, players bid with victory points, essentially. The game-winning resource is the same one used to bid, so if players far overbid, they can shoot themselves in the foot. (I’ve seen this problem especially in Modern Art; the problem isn’t quite so pronounced in Medici.) Proper evaluation of lots is hard, and no one is perfect at it, so this keeps players fairly equal. I’ve seen some large swings in score, but those have more been from failed gambits than from poor evaluation (risky behavior vs. ignorant play). Still, this may be a turn-off for some players. A word on components: the second edition is perfectly serviceable, although the colors are sometimes hard to tell apart on the commodity tracks. The pieces are of good material, though, and after playing the first edition of the game, anything is an upgrade, so I may not have the clearest view of components. All of this to say, if you have the option, do not buy the first edition of the game. It’s ugly, and the graphic design choices in it are baffling. The board is intended to confound and mystify. It does players no favors. And the wheat pictures in between numbers on the score track isn’t just ugly; it’s confusing. I don’t often rebuy games based on prettier versions; I rebought Medici. It’s a great game, and it deserves to look better than the travesty that is the first edition. I think Medici is an excellent game. It’s tense and fun, despite using the oft-bemoaned theme of trading in the Mediterranean. And despite its age (it was first published in 1995), it holds up remarkably well. The skeleton of the game is simple, which helps even new players adjust quickly (although it can still be hard to know how much to pay for auctions), yet there are exciting choices throughout to keep players engaged and coming back for more. While the game box says it supports 3-6 players, for my taste, this is a 5-6 player game only. (If you have fewer than five, might I suggest Ra?) Medici fits within a lunch hour comfortably (even if you’re teaching it with six players), and it’s interactive and satisfying the whole way through. This is one ship I recommend boarding.